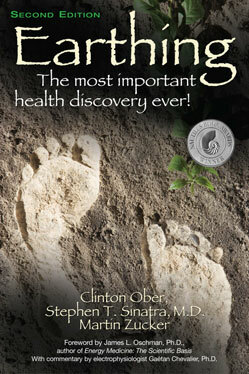 Groundology are official UK distributors for Clint Ober's Earthing™ products. In the last hundred or so years we have lost something vital for our health and wellbeing: our electrical connection to the Earth. With the advent of rubber and plastic soled shoes, and insulating mattresses in insulating houses, we spend our days and nights disconnected from the Earth. It's such a simple thing and yet the effect can be so profound. In our modern lives we can't always be outside and barefoot, and so the products offered on this website are designed to provide this electrical connection to the Earth in a convenient and practical way. There is another effect of grounding which is particularly relevant in our modern electrical world. Our environment is full of a wide spectrum of electromagnetic radiation, from computers, mobile phones & masts, radio & TV broadcasts, WiFi, Bluetooth, power lines, domestic wiring, and other electrical appliances. This electromagnetic radiation induces voltages in our bodies, disrupting the trillions of subtle electrical communications which are a vital part of the function of our body's systems. By being grounded to the Earth we greatly reduce the levels of these induced voltages. This video demonstrates this. We are electrical beings, living on an electrical planet, and our connection is vital for our health and wellbeing.